We at Avis want you to have a good and joyful experience driving around the Faroe Islands. We would like to emphasize the importance of driving carefully on the Faroese roads, especially during cold winter days with frost or hard wind gusts. We care for our customer and want you to have a wonderful experience when driving in the Faroe Islands. Our islands have so many things to give and so many wonderful things to see, but at the same time they can be very unforgiving to anyone that is not careful whilst driving. We don’t have bad weather, we just have a lot of weather! Therefore please be extra careful in harsh weather such as snow, frost and hard wind gusts. We have many hills and no car is able to climb them safely in these conditions. Also the wind gusts hit very sudden and often cause damage to the car doors, so please be sure you get a good hold on the door. 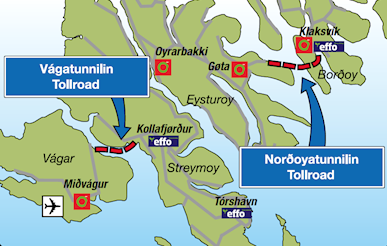 The toll for these tunnels is DKK 100 per drivethrough and will be added to your car rental bill. At the entrance of the tunnels there is signage advising to pay at service stations. This information is for private cars only, not rental cars. If paied at a service station, it will still be added to the car rental bill and will not be refunded. All our cars are equipped with a parking clock in the front window. This clock is to be set at the time of your arrival. Signs will tell if there is limited parking and for how long you can park. If you exceed this time you might be fined with DKK 200. Should this happen, this fine can be paied at a postal office. Or we can pay it for you for an additional administration fee of DKK 150.
are required by law both in front and backseats of the car. Most serious accident in the past years occurred because passengers or drivers were not wearing seatbelts. is 50 km per hour in towns and villages (exceptions are signed) and 80 km per hour on main roads. However, always drive according to the circumstances and in a way you feel comfortable with! They don't know the traffic rules and might sprint across the road in front of your car. Hitting a sheep is dangerous and will result in damages to the car (and of course the sheep) or even worse, you and your passengers. No insurance covers damages caused by animals.